/ 2-Part Blog / WHY GET YOUR WINDOW REPLACEMENT STARTED THIS SEASON? WHY GET YOUR WINDOW REPLACEMENT STARTED THIS SEASON? Compared to most home improvement projects, window replacement is a relatively less disruptive one. That means any time of the year is a good time to do it. But if you can choose, you should get it done this fall. Doing this improvement this fall is a perfect time to weatherproof your home. Considering the value of your efficient windows in weather resistance and insulation, it makes sense not to wait for the coldest months of the year to remodel. Although we can install your new double-hung, bay, and casement windows in St. Charles, MO, just fine in winter, it’s more advisable to do the project before the snow first falls in early October—when the air is drier and the caulking takes longer to cure. By September, the dem and for window replacement is on a downward trend. This means it’s easier to schedule your remodel compared to the earlier months. Unlike in busier seasons, it’s fairly simpler to set an appointment with the best window replacement company in town. At Renewal by Andersen of St. Louis, we’re committed to schedule your consultation at your most convenient time. This is why we’re confident to be more flexible in meeting you on the date your calendar permits. Generally, the weather is more predictable in fall. Even if we only need one day to get your windows installation in St. Charles, MO, done, we might need to reschedule it when the elements prove too harsh to deal with in hopes of ensuring the highest quality of service. Let’s get your project rolling ASAP. 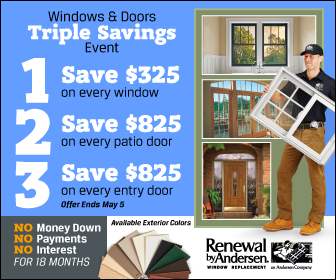 Call Renewal by Andersen of St. Louis now at (314) 332-2364 and schedule your appointment with our experienced window consultant.